This weekend was a baby shower for my friend Laura and baby Reagan. 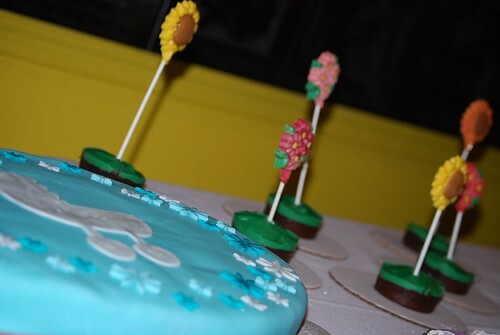 A couple other friends were throwing it and I volunteered to do the cake and some sweets. Up until I was actually decorating, I planned to stick pretty close to the original image, except perhaps putting flowers along the sides instead of swirls. I planned to add pink and orange flowers and got fondant shape cutters for that purpose. Unfortunately, my week didn’t go quite as planned, with my part-time job taking more time than I expected, so I didn’t begin the actual decorating until the night before. My friend Katie came over and helped with the color tinting and fondant rolling, which is definitely my least favorite part. (She’s awesome!) She was able to get the perfect shade of teal, while I worked on baking cookies. 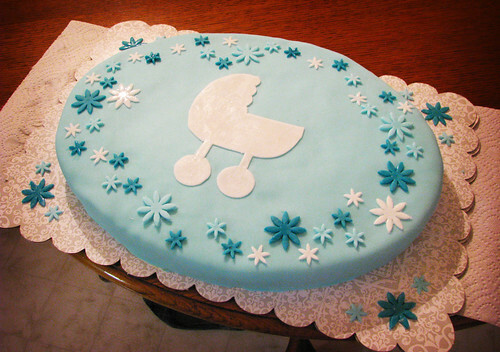 We ended up with more leftover teal fondant than I expected, so instead of tinting new colors, I cut some white and she tinted a deeper teal and I went with those for the flowers and stroller. I made these little treats as well. BEAUTIFUL. It turned out really, really well. Good work!